1. 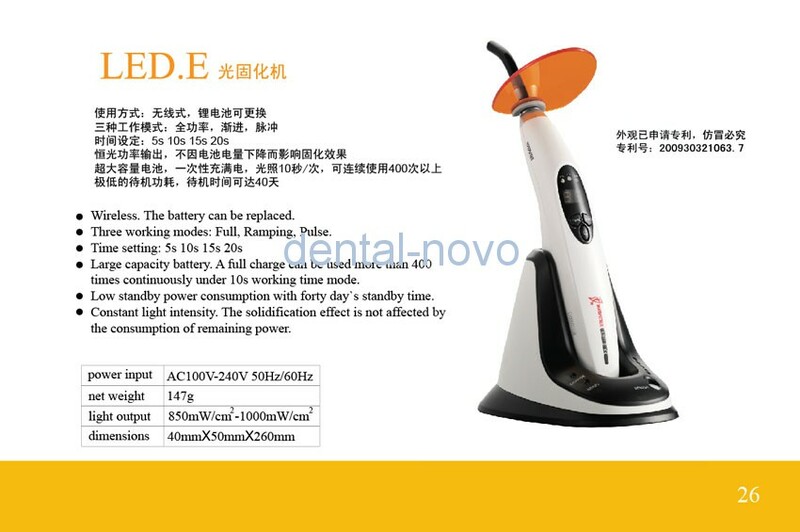 The LED.E curing light adopts the principle of ray radiation to solidify the light-sensitive resin by shooting at it in a short time. 2. This product is used for dentistry. It has the function of accelerating dental restoration and solidifying the material of dental whitening. 3. The LED.E is mainly composed by high power LED, optical fiber, main unit and charge device. 4. Wireless. The rechargeable lithium battery can be replaced. 5. Three working modes: Full, Ramping, Pulse. 6. Time setting: 5s, 10s, 15s, 20s. 7. Large capacity battery. A full charge can be used for more than 400 times continuously under 10s working time mode. 8. Low standby power consumption with forty days` standby time. 9. Constant light intensity. The solidification effect is not affected by the consumption of remaining power.